There are two basic types of tire pressure monitor systems installed in VW. The first type works off the ABS system and uses no additional sensors. If the wheel sensors detect that one wheel's diameter is smaller it assumes that the tire has lost air and trips the low pressure warning. The other type uses wireless sensors to directly measure air and temperature in the wheels and transmits the data to the car's computer. The indirect system was installed starting in 2007 when it became mandatory in the US. Because it's not yet mandatory in Canada, many new Canadian VW don't have the TPMS. VW switched to the direct system but has switched back to the indirect system for model year 2011 in Golf and Jetta. More expensive models like the Touareg still use direct sensors. The advantage of the direct sensors is that it's more accurate. The advantage of the indirect system is that it doesn't require a second set of sensors for winter wheels (unless you want to unmount the tires to remove the sensors) and because there are no sensors they don't need replacement when their battery dies. The battery life of TPMS sensors is about 6-9 years depending on use and it's non serviceable. While it's legal to have a TPMS which no longer detects tire pressure (except on a new car sale), it's not legal to disable the system or disable the light. A direct type sensor sits inside the wheel with only the antenna/valve stem sticking out. If the tire valve stem is metal and stiff with the lock nut on the base, you have a direct sensor system. If the valve stems are flexible rubber you don't have these sensors. A valve stem is the piece of tire that sticks out and where you add air. Warning: Never disable the TPMS light, disable the system, or disable the TPMS light if it's not legal where you live and/or operate the vehicle. 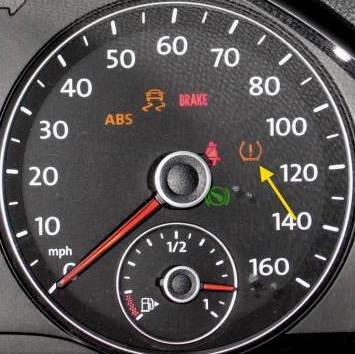 In the US, a functional TPMS warning light is required under Federal requirement FMVSS 138. See the TOS Agreement for the full legal disclaimer. If you have the direct system and have a compatible ABS control module, it might be possible to switch the indirect system for a second set of wheels or permanently switch to the indirect type system if you don't want to replace the sensors after their batteries die. 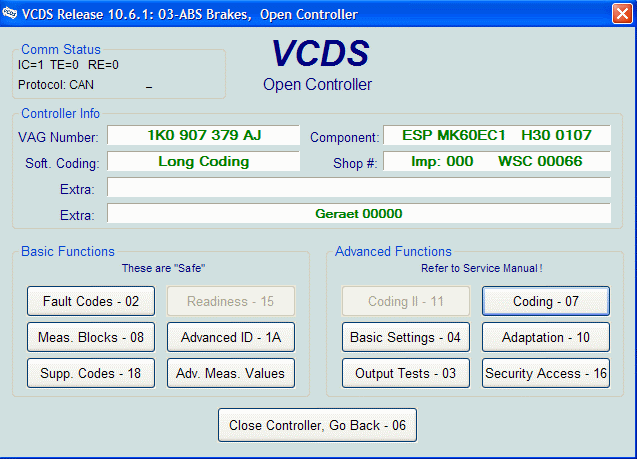 You must have a compatible ABS control module to make the indirect type system to work. I tried it with a 2006 ABS control module and it didn't work. More on this below. If you have direct type sensors, just add air to the recommended tire pressure. Check all the tires with a tire gauge. Sometimes you have to slightly overfill the air and then let the pressure go back down to the correct level. Never go higher than the max cold pressure printed on the tire. Refer to your owner's manual or driver's side door panel for the correct air pressure. If you have the indirect system, add air to the recommended tire pressure. Check all the tires with a tire gauge. Press and hold the TPMS reset button. This will reset the values that the ABS module looks for. First, if you don't have any TPMS or have the direct system and wish to switch to the indirect system, you should retrofit the reset button. You just have to add the button and a wiring harness to the car's electric module. These can be purchased from kufatec.com. Even if you don't have the reset button, you can still reset the light with a VCDS, you just won't have the button. If you don't have VCDS you just have to find someone to reset the light if the warning is ever tripped or add the reset button. 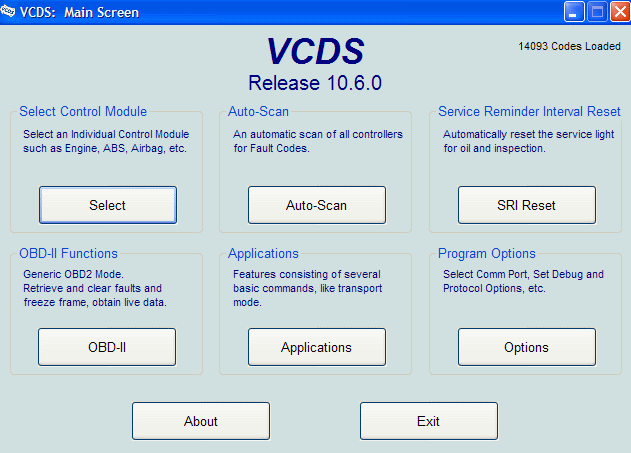 First plug in your VCDS cable and start the software. Make sure the green LED on the cable is lit. 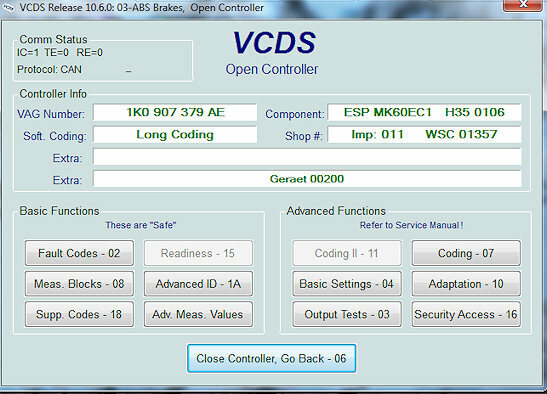 Click on "Select" to access the control modules. Click on "ABS controller" and you'll see this screen. The module part number "VAG Number" is from a mk6 Golf. You should see "Long Coding" under the Software coding label in green. I'm pretty sure that if you see a number there it means you have a non-compatible module. Click on Coding. Click on long coding helper. Write down your original code before changing anything! It will open the long coding helper shown below. Click the checkbox for "Bit 2 - Tire pressure monitoring (TPMS/7K6) installed". Exit the long coding helper and the new code will already be under "New coding". Click "Do it!" to save and use the new code. Exit the module. When you turn on the ignition, you should see the TPMS light briefly turn on. The system needs at least 1 hour of driving including on the highway to adapt. During that time the TPMS may not be reliable. 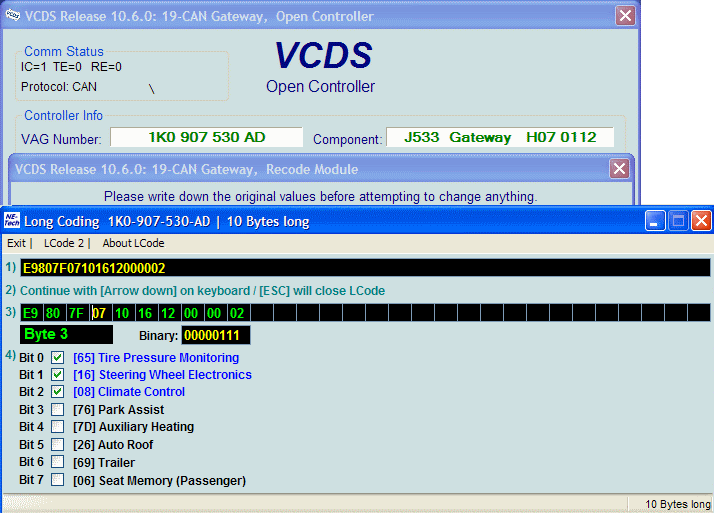 If you don't have a TPMS reset button, you have to manually reset it with VCDS. Go back to the ABS module and go to Basic settings. Go to "Group 042". Click Go! to reset it. Since I don't believe anyone has done a swap from a working direct to an indirect system, I believe that you may have to first disable the direct system for the indirect system to work. See the warning at the top and the TOS Agreement for the full legal disclaimer. Do not operate the vehicle on public roads in the US without the Federally mandated TPMS system or if it's not legal where you live and/or operate the car. Go back to the module screen and click on "CAN Gateway". Click on "long coding". Click on "long coding helper". You'll see the screen below. Uncheck tire pressure monitoring. Close the long coding helper and it'll automatically cut/paste your new code under "new code". Click "Do it!" to save. Exit. It's now disabled. 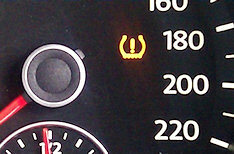 Make sure your TPMS system is functional before you go on public roads or highways. Go back to the CECM. In Byte 8, uncheck the box for TPMS 7k3/7k4/7k5 installed/active. Exit and save. Go to the ABS controller and you'll see the screen below. Click on Coding and enter the long coding helper. This module part number is from a mk5 2010 Jetta. Go to Byte 16 and check the box for TPMS 7k6 installed. You should see the TPMS warning light turn on. Reset it using basic settings group 42 as shown earlier. Last edited by Welder75; 01-21-2016 at 05:19 PM. the link was refereed to on another post here as well. thought i would share it all here on our own post!!!! Last edited by Welder75; 01-21-2016 at 05:43 PM. Hoping I could get some help here. I coded/activated a 2005 Canadian Rabbit via ABS control module to the 7K6 TMPS as the car is now in CA, USA. The TPMS light on the cluster now illuminates. However, when I tried to go reset it in the ABS module in the basic setting 042, I see a drop down that shows a line to reset TMPS. I select that line. But, there is no "Do it". After driving the car over a few days, the light persists. Is there something that I am missing? Any help would be appreciated. Please post an Auto-Scan of this car so people can see what it's made of (specifically exactly what ABS system it has). Once you do that, I'm going to split these messages into a new thread because a 2005 is definitely not an Mk.6 car. Thanks Uwe. I will get the car in again and grab an autoscan. You may need to click the [ON/OFF/Next] button. Do you have coding for new Passat B8, 2015, MQB platform ? I dont now how to disable TPMS over ABS. I have instaled direct TPMS with sensoren and antenna "65"
Thank you for a great write-up Welder75. This thread is pretty close to what I'm looking for so I'm posting my question here. I have a 2017 MQB Mk7 Golf, USA with indirect TPMS from the factory. What I'm looking for is the adaptation/setting/channel where the ABS stores the pressure value after resetting via the TPMS reset button/menu. Back when I had VWs with direct monitoring there was a field where you could set the value you wanted. I want to check the value on my car and be able to change it. First and foremost because I'm running different sized tires than it came with and second off when I had a nail in my tire recently the shop reset the button before all tires were filled to the correct pressure so I want to know what value it's set to. What I'm looking for is the adaptation/setting/channel where the ABS stores the pressure value after resetting via the TPMS reset button/menu. I think you're misunderstanding how indirect TPMS works - it doesn't have pressure sensors so it cannot measure/store any pressure values. It measures the rotational speed of each wheel using the ABS sensors, and with some weird software compares that, with tolerances, against values of rotational speed for each wheel that get stored after you use the TPMS reset button/menu. When you change wheel sizes or pressures all you have to do is set all the tyres to the correct pressures and reset TPMS. Since you can't see the pressures (as they're not measured) if you're unsure of the set values being used by indirect TPMS then just assume they're wrong and reset TPMS yourself when you know the pressures ARE correct.